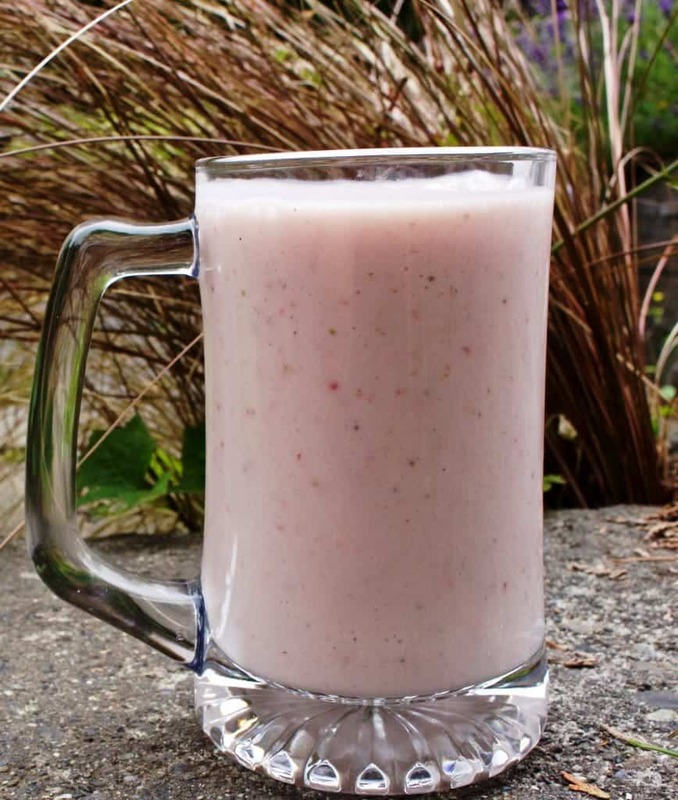 Comforting, filling, creamy, fresh strawberry banana smoothie. A perfect, high energy, breakfast in a mug, for a busy morning. Blended with coconut milk and Greek yogurt with a scoop of ice cream for an optional bit of yum. This smoothie is Low-Sodium, Vegetarian and Gluten-Free! Saturday. Not our usual happy, lazy, weekend morning. We woke up late. Dave spent an hour on the phone slaying the internet dragon. The washer also threw a breaker so he had to hunt down that problem. After all THAT… he had to go to work. On a Saturday! Great morning for breakfast in a mug! He drank his breakfast while pacing the floors, talking to Comcast and thinking about all the things he needed to be doing while they kept telling him to “please hold”. He held all right. He held onto his patience for an hour on the phone. He paced, talked tersely (but politely) to comcast and chugged his fresh strawberry banana smoothies. He held while watching the clock. He held when repeating his story to several support people. Some days need a reset button! Happily, we had fresh strawberries in the fridge. 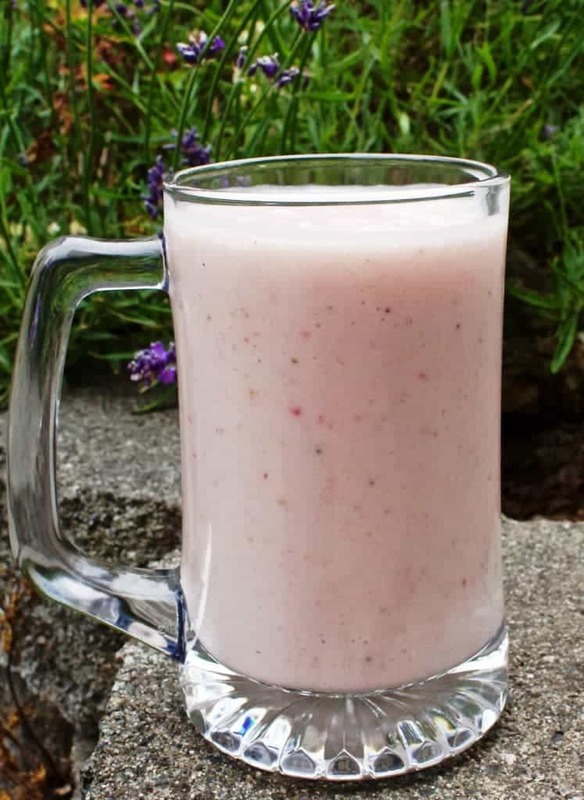 I added very ripe bananas, greek yogurt, coconut milk….And, just because the day started out so rough; I threw in a bit of my Homemade French Vanilla Bean ice cream. Just to make it all better. Strawberries and bananas are a match made in heaven. 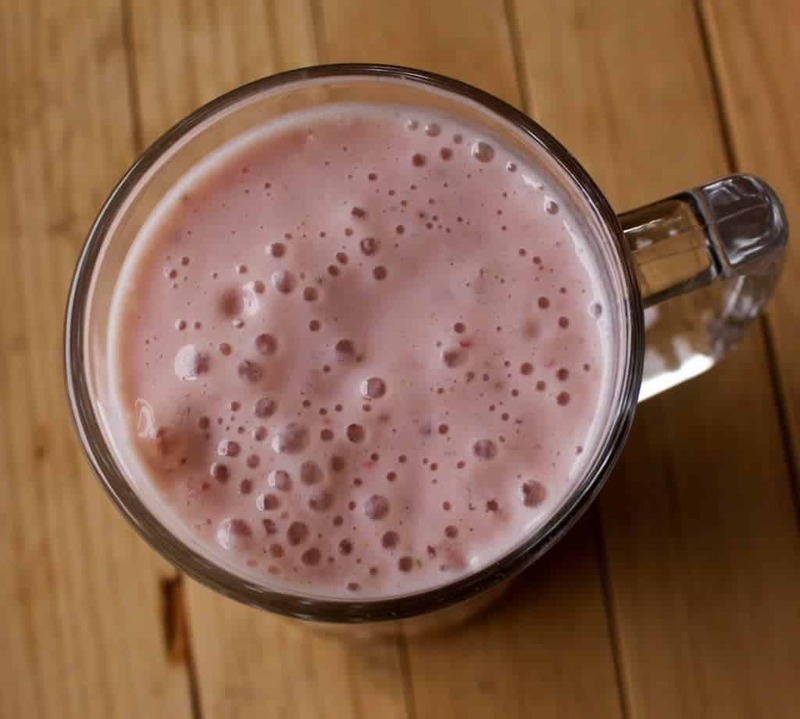 The coconut milk adds sweet goodness to this healthy breakfast drink. The yogurt adds body,…and the optional ice cream adds a bit of creamy indulgence to bring that creamy, sweet smoothiness up a level. If you haven’t made homemade ice cream yet…do! Don’t let the high calorie count on this smoothie scare you. If you don’t need all those calories, eliminate the ice cream, double the yogurt, and add in one tablespoon of maple syrup or a few drops of liquid stevia to taste. This morning, Dave needs those calories. He has a very high energy job. This delicious smoothie, and a big sandwich will have to hold him all day. I really need to go to the store! He drank TWO of these smoothies. He’ll use every calorie of this breakfast! Theose sweet carbs will be very welcome today! Feel free to tweak this recipe to your own tastes and needs. I’m not thinking low cal today. I’m thinking giving my guy a much needed boost of comfort food in a mug. Healthy? For him? Yeah. This is a good, filling, fast, on the go breakfast; for THAT kind of day. I’m pretty sure it will be a hit with your family any kind of day! In your blender, add the coconut milk, yogurt and ice cream. Pulse it with a lid on. Add the washed, hulled strawberries(however many you like), and pulse again once. Peel the bananas and add them into the blender in chunks. Pulse until the smoothie is blended. Enjoy! Sweet, Creamy, high energy breakfast on the go! 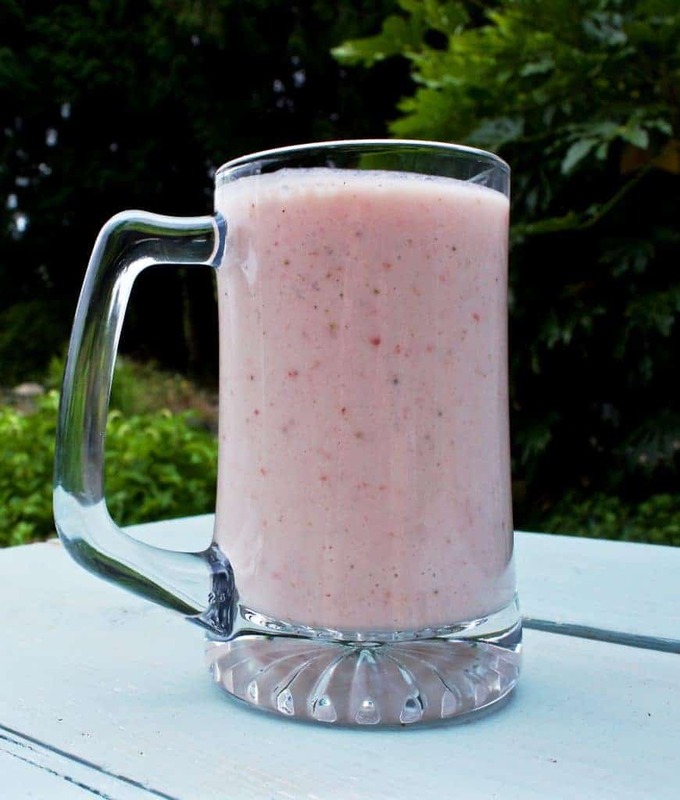 I love strawberries and bananas so this smoothie is a win win one! Enjoy Katerina. You will love it! Creamy and delicious I will take one for breakfast! This smoothie is delicious, Jennifer. Enjoy! This looks like breakfast and dessert to me! It reminds me of my favorite milkshake, only healthier:) Thanks for joining us at Saucy Saturdays! It is yummy! Thanks for the visit Jennifer! Love smoothies. So does my whole family. Thanks for this and for linking up to #SaucySaturdays. Beautiful smoothie, some of my favorite flavors! This looks very healthy indeed Diane! Pinned and shared and hope to see you on Saturday! Thank you Joanne. I plan to attend!